I’ve talked here before about how one of my mercury symptoms was a mild case of OCD caused by low serotonin. Instead of taking a prescription drug to raise my serotonin, I’d gotten good results by taking the supplement Inositol. Then I’d heard about a concept called serotonin snacking. A scientist called Judith Wurtman had written a book that in essence said that if you ate a carbohydrate snack a couple of hours before dinner every day, your serotonin level would go up. No side effects. Theoretically, this would mean that if you snacked right, your anxiety would decrease, your sleep would improve, you’d be more flexible and less obsessive. I decided to give it a try. Since I ate my dinner at precisely 7pm every night, I started eating two rice cakes at precisely 5pm every evening. I don’t know if you know this about low-serotonin people, but they certainly like their routine. I got my first big clue that this thing was working when I woke up one morning and saw that the bedroom smoke alarm wasn’t up on the ceiling anymore. It was sitting on the dresser, dismantled. How had it gotten down from there without my noticing? It had been up on the ceiling before I went to sleep. I was such a light sleeper, I woke up every time my girlfriend rolled over or the cat jumped on the bed. There was no conceivable way the alarm could have gotten from the ceiling to the dresser without waking me up. I quizzed my girlfriend about it. Me: Did you take the smoke alarm down last night? Me: Before we went to bed? Her: No! In the middle of the night when it started beeping. Oh my God it was so loud. Me: The smoke alarm went off and I didn’t wake up? Her: The stupid thing beeped because the battery died. I had to climb up on the dresser to hit the button to make it stop, but it wouldn’t stop. I had to pull the whole thing off the ceiling and take the battery out. Me: And you did this extra-quietly so you wouldn’t wake me up? Two rice cakes. 5pm. Every day. Now I was sleeping like a log. Like a really deaf log. And I was noticing other changes. I was calmer, less anxious. I didn’t have to plan. Every. Single. Detail. Of. My. Day. I could be a little spontaneous. It didn’t matter now if I ate my dinner at 7 or at 6, or sometimes at 8. My serotonin snack got more flexible too. Sometimes I went wild and didn’t eat rice cakes, I ate popcorn or pretzels instead. Fun. Two years later, it still blows my mind that this little trick works so well. If you’re low serotonin, maybe it will work for you too. You can find out more by reading Judith Wurtman’s books The Serotonin Solution or The Serotonin Power Diet. The books talk a lot about weight loss and controlling overeating, but you can skip that stuff if it’s not relevant for you, and just focus on getting your serotonin level back up where it should be. ← Can’t eat wheat? What’s in your teeth? 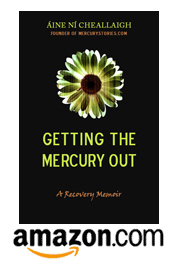 I love that you cover such unique aspects of mercury toxicity and that you write about it in such an interesting and often times amusing way. Thanks for sharing as this post and your last one about wheat really hit home.